A mesomorph is someone of average height who has a little fat. And puts on muscle easily! Meso's are one of William Sheldon's three somatotypes. The other two are endomorph and ectomorph. Medium bones and solid torso. Low fat levels, though the fat does accumulate around the middle. Broad shoulders and a tight waist. 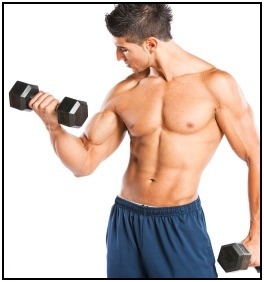 A meso easily puts on muscle mass and increases in strength. Meso's have that part so easy! Their biggest danger is overdoing it with exercise. Since they already have muscles, and can make rapid gains, meso's have a tendency to go overboard working out. So, take it slow. Meso's also respond better to 3 sets of 10 - 12 rep when doing exercises. This number of reps primarily builds muscle (rather than strength or endurance) which, combined with the meso's inclination to build muscle, will get you big quick. This is the best natural body type for bodybuilders. Building muscles is easy for you, and that the meso's strength. Just keep in mind that it is rare for a person to be a pure meso, endo, or ectomorph. The vast majority of people embody varying degrees of all three body types in themselves. OK, here's the un-orthodox news for mesomorphs and somatotyping. First, you somatotype is not genetically determined. If you're a meso, you probably do something physical. If you happen to be an endomorph, and put on weight easily, you might eat a lot or hang out with people who are also fat. Whatever body type you are, there are both nature and nurture factors that led you to that body type. Not pure genetics, and not pure bad (or good) habits. So, no blaming evil genes. And no being lazy because you 'got lucky' either! Also, when William Sheldon put together this system in the 1940s and 1950s he (1) did not look at his subjects genetics and (2) his subjects were all incoming freshman at Ivy League collages. This skewed his ability classify body types. And I'm sure Ivy League freshman are not a representative sample of the general population. What I'm saying is that the mental attributes given to his different classifications (like motivated, unmotivated, aggressive, etc.) are BS. You can't know someone's personality or ability to be motivated simply by the fact that they are muscular, fat, skinny, tall, etc. The endo, ecto, and mesomorph labels are useful for describing people's current body types. But no more than just saying, "I gain muscle easily." Take a look at this information about somatotypes to learn more about Sheldon's work. You can also find out how he used his classification system, and what the limits of somatotypes are. • Click here to leave 'Mesomorph: Solid and Muscular' & go back to the Home-page! 1. Kubik, Brooks D. 2010. Strength, Muscle, and Power. Louisville, KY: Brooks D. Kubik Enterprises, Inc. Pp. 96. 2. Budilovsky, Joan, Eve Adamson, and Carolyn Flynn. 2006. The Complete Idiot's Guide To Yoga: Illustrated. New York: Alpha. Pp. 21.